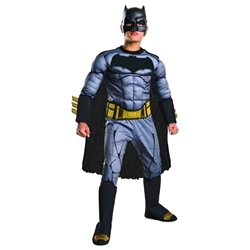 Six piece deluxe quality kid's costume that includes muscle padded jumpsuit, gauntlets, boot tops, belt, cape, and mask. Available in child's size small, medium, or large. The gray and black Batman jumpsuit features padded arms and chest that gives the appearance of muscles. The costume is accessorized with 3-D arm gauntlets and boots tops as well as a belt, a cape, and a Batman face mask. This Batman kids costume is styled after Batman's superhero outfit from the 2016 movie Batman v Superman: Dawn of Justice. In the movie Batman v Superman: Dawn of Justice Batman's (Bruce Wayne) views Superman (Clark Kent) a threat to the city of Metropolis after Superman's battle with Zod devastated the city.